Reminding pet owners that tick bites can lead to lyme disease. 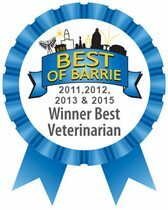 Schedule your appointment for Heartworm test, prevention medication, for Fleas and Ticks as well. 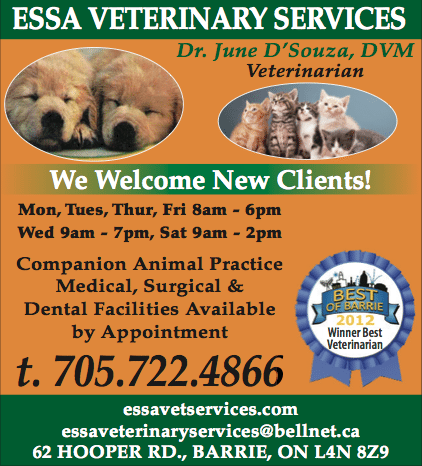 At Essa Veterinary Services we are committed to your puppy or kitten’s well-being as we watch his healthy development into your fur-ever friend. Get our address - find us on Goole Maps. Telephone/Fax us. Send us an email / Give some feedback, we would love to hear form you! Meet our professional and exceptionally friendly staff. We are always here to help you and your pets get the best care possible. Whether it's a checkup, dental care, pet vaccinations or surgery, we provide the latest veterinary care for your small animal friends. A healthy pet is a happy pet. 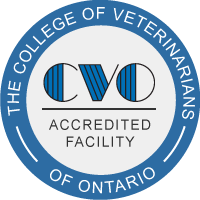 That’s why whether it be regular check-ups and shots, neutering and spaying, and even exotic pets the skilled veterinary staff at Essa Veterinary Service offers the highest quality of care. We are conveniently located in the south end of Barrie, with plenty of parking. Let our professional and friendly staff take care of your companion! We help to foster a long relationship with your pet through education, preventative medicine, and examinations.